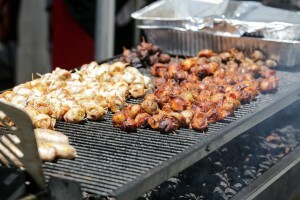 The Big Bite Bacon Fest returned to The Queen Mary for a second year on August 1-2 with more bacon infused delicacies and craft beer tastings than imaginable firmly earning its place as the West Coast’s largest bacon festival. Thousands of bacon-loving event-goers sampled over 8,000lbs of pork during three tasting sessions across two days of bacon filled fun and fellowship. The event raised $10,000 for America’s Veterans with charity partner Team Red, White and Blue (Team RWB) to assist in enriching the lives of America’s veterans by connecting them to their community through physical and social activity. More than 50 local restaurants and chefs offered their own unique spin on the main ingredient – bacon! Offerings spanned breakfast, lunch, dinner, dessert and even some bacon inspired beverages. A few of the most popular and creative bacon dishes included Dia De Los Puercos’ “Hog Pocket”, Whole Foods Market, Long Beach “Cherry Bomb Meatball” stuffed with jalapeno bacon, gouda cheese and chipotle seasonings, The Red Leprechaun’s “Bacon & French Toast” bread pudding and The Bacon Babe’s dark chocolate bacon tarts with cinnamon whiskey buttercream. Severin Stone & the Richeeze Truck took home the People’s Choice Award for their bacon mac ‘n’ cheese slider. The cast and crew of Alt 98.7 FM’s top rated morning show, The Woody Show, joined the festival to select the Critic’s Choice Award winner. After much bacon sampling, the show decided on Chef Nathaniel Nguyen of the Prince & Pantry and his popular “Millionaire Bacon Bar” as the lucky winner. The Critic’s Choice Award also includes a “Golden Ticket” invitation to compete for Bacon World Championship and $10,000 at the annual World Food Championships in Kissimmee, Florida, November 3-10, 2015. More than 40 craft breweries and distilleries including Absolution, Angel City Brewing, ACE Cider, Angry Orchard, Bacon Vodka, Bootlegger’s Brewery, Deep Eddy Vodka, Lagunitas Brewing, Samuel Adams, Shock Top, Sierra Nevada and Hard Rock Café with their Twist and Shout Shake with Guinness, Spiced Rum and bacon! VIP bacon lovers enjoyed early access to the festival, exclusive bacon sampling with chefs and vendors only serving the VIP area, and a gift box, courtesy of Bundt’s on Melrose, with a maple bacon mini Bundt cake… a take home bacon night-cap. Festivalgoers wore their stretchy pants and squeezed in a little exercise between tastings of all of the delicious bacon items to enjoy games of Pork Ladder Toss, Bacon Bags, Bacon Bungee Run, Bacon Maze, and live music on the main stage. KFI’s The Fork Report host, Neil Saavedra, joined the event this year and broadcast the radio show live from bacon central. Bacon purveyors stopped by his booth to offer samplings and talk live on-air about their bacon offerings and the festival. Stay connected for future Big Bite Bacon Fests and other entertaining events at www.queenmary.com and www.bigbiteevents.com.